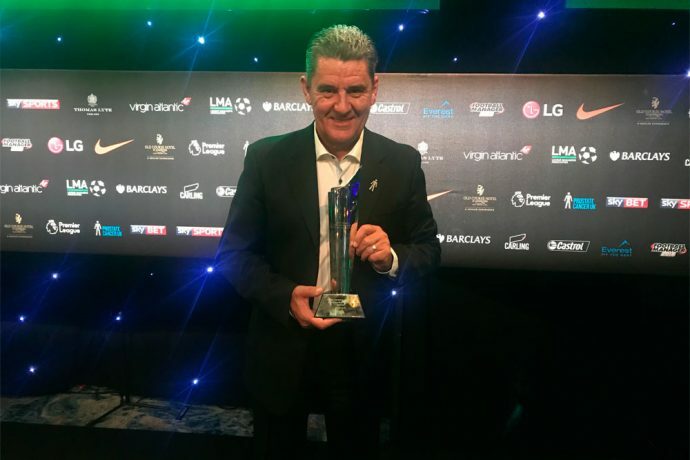 Chennaiyin FC Head Coach John Gregory was honoured at England’s League Managers Association (LMA) Annual Awards on Tuesday evening in London as he received an LMA Special Achievement Award. Gregory was awarded for becoming the first Englishman to win the Indian Super League. The League Managers Association is a body in England for English coaches and all managers in English football. The LMA hosts an awards night annually to reward the best performing coaches in English football every season and also recognise efforts of English coaches from around the world. Tuesday was their 26th Annual Awards Dinner. On an evening where Manchester City manager Pep Guardiola was among the winners, Chennaiyin’s Gregory received the award from former Manchester United and Everton manager and current West Ham United Head Coach David Moyes. A short video on Chennaiyin’s 2017-18 Indian Super League triumph was shown to a star studded audience which included current Premier League managers Sam Allardyce (Everton), Roy Hodgson (Crystal Palace) and 2018 World Cup bound head coaches Gareth Southgate (England) and Roberto Martinez (Belgium). “It was fantastic to win the title in my first season in India. Football in India is growing and the ISL is getting better and better. The standard of football is improving and more people are taking interest. I just can’t wait to go back and try and defend the title,” Gregory said after receiving the award. Under Gregory, Chennaiyin FC won their second ISL title on March 17 by beating hosts Bengaluru FC 3-2 in the final and finished the campaign with an eight-game unbeaten run. That victory also ensured Gregory’s CFC side a place in the 2019 AFC Cup. The 64-year-old Englishman has already been retained by the two-time ISL champions as he signed a one year extension back in March.